Four publishers improved their rankings compared to April 2018. The most viewed publisher generated over 2B video views. Let’s take a look at three of the most interesting stories from the May Leaderboards. I want to focus on the biggest movers on the list: Blunt Kommunity, which jumped 8 spots from #10 in April to #2 in May; 5-Minute Crafts, which jumped 5 places from #15 in April to #10 in May; and People Are Awesome, which jumped 25 positions from #36 in April to #11 in May. Hey, find out where they get their whiskey and order me a barrel. What kind of content is Blunt Kommunity creating? Well, their most viewed video uploaded to Facebook in May was “Maasai Shoe making tutorial Kenya Africa.” Uploaded on May 21, 2018, it currently has 49.4 million views and 557,000 engagements. And it’s 4 minutes and 39 seconds long. This isn’t a fluke. Their second most viewed Facebook video that month was “You rarely see these scenes on the street.” Uploaded on May 17, 2018, it currently has 47.6 million views and 649,000 engagements. And it’s 3 minutes long. And, since I’m a believer in the rule of threes, check out their third most popular video. It’s entitled, “Breathtaking Magic Street Trick ” Uploaded on May 4, 2018, it currently has 39.0 million views and 247,000 engagements. And it’s 3 minutes and 42 seconds long. Now, I don’t know about you, but I find these Facebook videos longer than conventional wisdom would have recommended. And I find their content to be unique, compelling and entertaining or informative. In other words, it’s exactly the kind of content that Version 2 of YouTube’s Creator Playbook was urging publishers to produce six years ago — 8 months before YouTube started adjusting the ranking of videos in YouTube search to reward engaging videos that keep viewers watching. Back in February 2012, that playbook said, “There are no rules to making great content” and there aren’t any “guaranteed ‘tricks’ to get more views.” And that seems to be the case on Facebook today. And “making video content that people want to watch, talk about and share” is the key to success on Facebook today. Here is the critical data that shows this. In February 2008, Blunt Kommunity had 22.1 million monthly views. In March, that had grown to 340 million monthly views. In April, Blunt Kommunity had 791 million monthly views on Facebook. And in May, it had almost 1.8 billion (with a “b”) monthly views. Now, I’m not a member of their target audience. But, 5-Minute Crafts has also created unique, compelling and entertaining or informative content that is resonating with a ton of DIY enthusiasts. In February 2018, they got 461 million views on Facebook. This grew to 489 million views in March, 693 million views in April, and 839.7 million views in May. Their most viewed Facebook video in May is entitled, “No one is ever too old for dolls.” Uploaded on May 3, 2018, this video has 58.2 million views and 987,000 engagements. Oh, and it is 5 minutes and 8 seconds long. 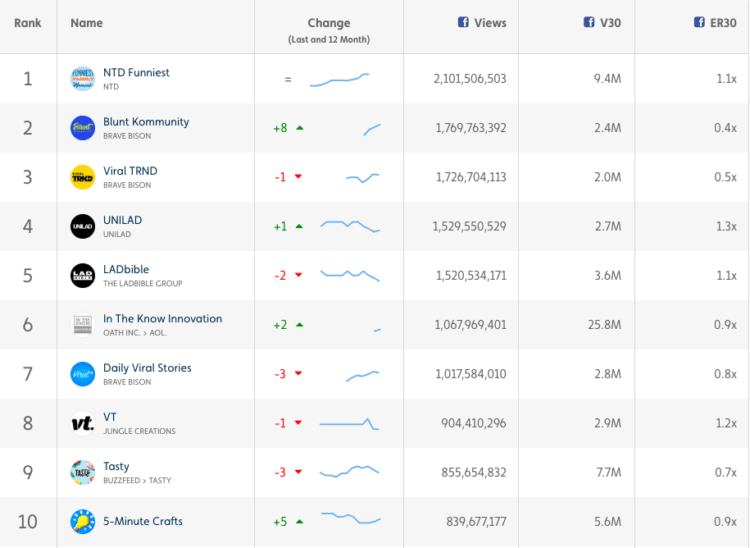 Just outside the top ten, UK based People Are Awesome take the #11 position by making “amazing videos of people doing incredible things!” And their content is driving dramatic growth on Facebook. In February 2018, People Are Awesome got 172 million views. This grew to 280 million views in March, 413 million views in April, and 839.4 million views in May. Their most viewed Facebook video in May is entitled, “Best SKYDIVING & BASE JUMPING!” Uploaded on May 22, 2018, this video has 91.2 million views and 1.5 million engagements. And it is 3 minutes and 34 seconds long. So, yes, Facebook uses signals like how many people react to, comment on or share posts to determine how high they appear in News Feed. And with the recent update to their News Feed algorithm, Facebook is also prioritizing posts that spark conversations and meaningful interactions between people. But, at the end of the day, what triggers likes, shares, and comments is content. And if you create unique, compelling and entertaining or informative content, then you move up in Facebook’s News Feed. And, if you create great content, then you move up in Tubular’s leaderboards, too.